Over their 19 year career Blue Grassy Knoll have cemented their place as one of Australia’s most well-loved, accomplished and enduring performance troupes. In recreating the silent movie experience the band sits watching the film with the audience, playing their own original compositions and using the film itself for their cues – a truly amazing experience to witness. When writing for silent films, the Blue Grassy Knoll have developed an organic process of generating music to moving image that is uniquely collaborative. They draw on influences from a hugely diverse range of musical sources, creating arrangements and textures that mirror contemporary film scoring concepts. They aim to re-invigorate classic films with a modern aesthetic and energy, as well as inject a spontaneity that comes with live performance and improvisation. Their aim is always to deliver what they believe would be the intention of director had he knowledge of today’s film scoring techniques. During the composition process, discussion occurs about the possibilities of each scene of the film – where it sits in the narrative arc, what it’s potential is in telling the story, and how the music can assist in revealing to the audience the emotional journey of the characters involved. Much of the effectiveness of the resulting music depends on the skill and artist vision of the film’s director. With Buster Keaton, Blue Grassy Knoll found a natural symbiosis, both in humour, style and breadth of vision. Their unique live film score accompaniment have received multiple 5-star rave reviews at both the 1999 & 2000 Edinburgh Festivals and has taken them to all 5 continents, including seasons on Broadway and in London, as well as performances in Brazil, China, regional USA, Canada, Singapore, South Korea, the Netherlands, Germany, New Zealand and South Africa. After forming in 1996 in Melbourne, they quickly developed a local cult-following, and played most of the major festivals in Australia, performing at the Sydney Opera House, appearing on national TV and radio, releasing 4 CDs, receiving funding grants from Arts Victoria and the Australia Council, and being commissioned to write scores by the Victorian Arts Centre, Sydney Opera House, Australian Theatre Festival in China, and Melbourne International Film Festival. 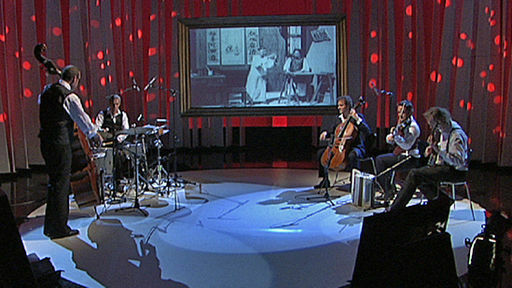 In 2010 Blue Grassy Knoll represented Australia at World Expo in Shanghai performing their score to the 1921 Chinese silent movie Labourer’s Love, and were a hit at the Brisbane International Arts Festival in 2011. They have been programmed as part of Arts Festivals, Music Festivals, Film Festivals, Comedy Festivals, Children’s Festivals and Senior Citizen’s events. Band members have also worked individually with many of Australia’s most prestigious bands, artists and companies as musicians, composers and sound designers in their own right. 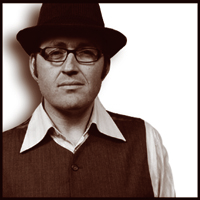 banjo, flute, guitar, slide whistle, thunder sheet Gus Macmillan has worked in the arts industry over the last 21 years as a composer, musician, sound designer, manager, and producer. In 2004 he completed a Graduate Diploma Course in Sound Design at Victorian College of the Arts, working with sound and music in a variety of different of art forms including dance, theatre, film, documentary, circus and puppetry. He is composer-in-residence forRed Span Dance Company, and worked in London as composer withTheatre O’s production of Delerium, performed at The Barbican Theatre. Gus runs Melbourne’s School of Banjo, and was the 2005Guildford Banjo Jamboree’s two-tune pick-off champion. He has an Honours Degree in English and a Masters Degree in Australian Studies. Mark Elton double bass, tuba, cornet A highly regarded Musician in the Australian music scene, Mark has established himself as one of Melbourne’s leading Double Bassists. Mark has travelled extensively and played with some of the world’s best musicians and has earned recognition on the international jazz stage. He is a regular member of Melbourne institutions ‘The Hoodangers’ and FLAP! And has also performed with artists such as Americans Leroy Jones, Dan Barrett, Rebecca Kilgore, and Australian artists James Morrison, Nina Ferro, Julie O’Hara, Bob Barnard, CW Stoneking and Joe Camilleri. Mark’s background in Jazz brings a unique flavor to Blue Grassy Knoll. 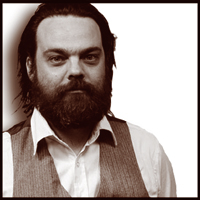 Philip is a multi-instrumentalist, composer, performer and teacher. 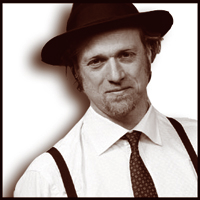 He has toured the world, and played Double Bass with the Spaghetti Western Orchestra and Mikelangelo and the Black Sea Gentlemen, Cello with Missy Higgins and Snuff Puppets Accordion with Russian Criminal band Vulgargrad and Red Dash Tango. He has composed music for The State Orchestra of Victoria, ABC Radio productions,Snuff Puppets and Theatre at Risk. 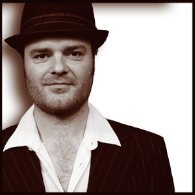 He works regularly with Irish Cabaret singer Camille O’Sullivan, Mick Thomas and The Sure Thing,The Mighty Buzzniks and has been the resident musician for the Edinburgh and Melbourne seasons of the Famous Spiegeltent’s La Clique. He has recorded and contributed to many CD’s and movie soundtracks including Animal Kingdom and Noise. guitar, percussion, foley, tin whistle After studying Music at the University Of Melbourne, Simon played in a number of Melbourne bands before the creation of the Blue Grassy Knoll in which he takes on the role of guitarist, percussionist and MC. More recently, he has been working as a Production Manager and Sound Engineer for The Famous Spiegeltent, the Melbourne International Comedy Festival, and The London Hippodrome. Currently residing in the city of London, Simon can usually be found travelling with the international acclaimed circus/cabaret show “La Clique” as Technical Manager and Front Of House Manager. Steph is a freelance musician, sound engineer/designer, composer, and music software developer. 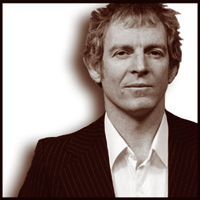 He has composed and recorded music for many Australian theatre companies including Flying Fruit Fly Circus (The Promise – Helpmann Award, Pirates, Crunch, Circus Under My Bed), Polyglot Theatre (Ants, Paper Planet, Separation Street, Tangle), Peep Show Inc.(A bird, a tree the moon, Divine, Magdelan Asylum). He has also provided sound design for Ennio Morricone Experience (The Session – Green Room Nomination), Spaghetti Western Orchestra, NICA, Ilbijerri Theatre, Snuff Puppets, LemmonyS, Polyglot Theatre, Rawcus, Chamber Made Opera. Steph also has worked as a sound engineer both in Australia and abroad including 4 years at The Melkweg (Amsterdam), Assembly Rooms (Edinburgh Fringe Festival), Kölner Philharmonie, Montreal Jazz Festival as well as many European tours. Steph continues to work for both local and international festivals, theatre company’s, recording studios and broadcaster’s. He also pursues developing music software, both for commercial and as an indie developer, building applications for the web, theatre, music, games and real-time performance. He has released his own software synthmate and bip.